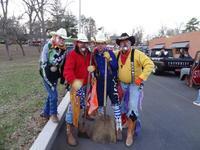 How can 4 guys like Tommy Watson, Richard Moss, Woody Gladden and Cody Watson clowning around be called a ministry? Because IT IS! They show the love of God in such special ways as they bring smiles and laughs to everyone who comes in contact with them. They bring smiles to faces in places all the way from nursing homes to children's hospitals to rodeos and events here at Cowboy Church. Since laughter is called the "best medicine", it's safe to say that these "clowns" will be in "business" for quite a long time . . . . going about GOD'S BUSINESS . . . blessing people.